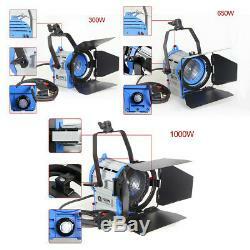 As Arri For Film 300/650/1000W Fresnel Tungsten Spot lighting+case+Air stand Kit. 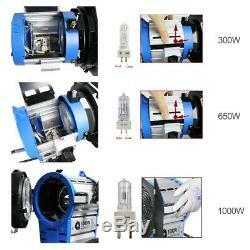 Package included 1PCS:1000w Light with globe 1PCS:300w Light with globe 1PCS:650w Light with globe 3PCS:Air Cushioned Stands (can better protect Lights) 3PCS: Dimmers 3PCS: Colour Gel (change 3200k to 5600k) 3PCS:Safety cable (24 inch; Load 44 Lbs) 3PCS:Clamp Hook (Load 33 Lbs) 12PCS:Clip 1PC: Soft Case with wheel. 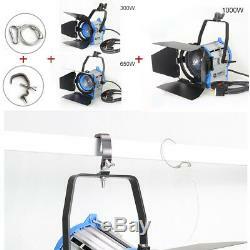 Description 1Like Arri type spot light , 4 leaf can rotates barn door. 2compact type Tungsten spotlight, High luminous efficiency, Light gradient uniform, attractive appearance 3Rustproof and corrosion resistance of high-strength aluminum alloy structure 4Light socket used GY9.5 type accords with the international standard. 5Fit for Movies; Commerical ;TV special; Digital photography;Commercials Shooting. 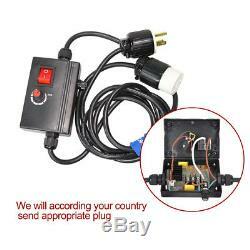 3.5m with in-line switch. Dimensions mm (H x W x L). 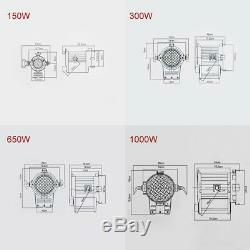 145x 170 x 155 mm. 370 x 230 x 180 mm. 430 x 290 x 250 mm. 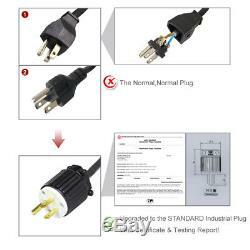 However, we will try our best to minimize the extra charge for our customers. All our items(unless otherwise specified) are assured to be brand new and carried with fully at least. For damage on arrival, please be cooperative to take photos on the damage and send to us for verifying. For confirmed tiny product faulty, on your approval, we can send you replacement parts, mostly they are free, but for those expensive parts, you can just return the damaged parts for swapping good ones. Feedback is very important to us. It is impossible to address issues if we do not know about them! Customer satisfactory is most important to us. If you have any questions, please feel free to contact me! Please give me at least 24 hours to reply! (GMT+8) of Monday to Friday. And our company is closed on Sunday and public holiday. 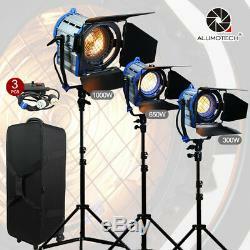 Package include 1PCS:300W Light with Globe 1PCS:650W Light with Globe 1PCS:1000W Light with Globe 3PCS:4 leaves barn door 3PCS:dimmers 3PCS:Air Cushioned Stands 3PCS:Colored Paper+Safety Cable (24 inch ; Load 44 Lbs) 12PCS:Clips 3PCS:Clamp Hook (Load 33 Lbs) 1PC: Soft Case with wheel Thank you for choosing our Fresnel Tungsten Spot Light. As a manufacture, we have been working on upgrading products, improving user experience, make the products safer, and easier to operate. We also have been working on completing supporting facilities: a. Upgraded Normal Plug to the STANDARD Industrial Plug which with Testing Report&Certificate b. Installation of Bracket is Improved, using easier. 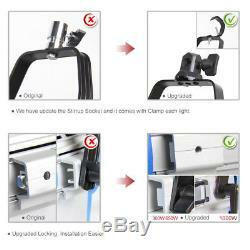 We use the solid aluminum Stirrup to support light, it is not quickly broken. The item "As Arri For Studio 300/650/1000W Fresnel Tungsten Spot Light+Case+Air Stand Kit" is in sale since Thursday, May 19, 2016. 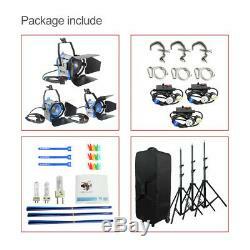 This item is in the category "Cameras & Photo\Lighting & Studio\Continuous Lighting\Lighting Kits". 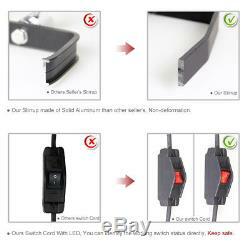 The seller is "iz-link" and is located in HongKong. This item can be shipped to United States, all countries in Europe, all countries in continental Asia, Canada, Mexico, Australia.